I’m sure by now you’ve heard about the world’s deadliest Ebola outbreak effecting Liberia, Sierra Leone and Guinea. When President Sirleaf recommended on July 30th that schools close, we had to follow suite for the safety of our girls, staff, and community. On July 31st, we had our last day of summer school for the girls. On that day, we gave care packages to the girls that included workbook pages to keep them busy and learning, medicine for fever and bacterial illnesses, Ebola awareness posters, health care referral forms, oral rehydration solutions, chlorine, soap, and rice. All students and staff also attended an awareness class led by doctors and staff from UNICEF, the IRC, and Ministry of Health. While the school is closed, all expat staff members are being relocated to the US. We have been monitoring the situation on the ground through ongoing contact with NGOs, government ministries, and our local staff. To date, we’ve had no reported cases of Ebola related illness in students or staff. On Friday August 22nd, our founder Katie Meyler arrived in Liberia to help the West Point community, where the majority of our girls live. You can follow her journey at http://racingheartblog.tumblr.com/. Workbooks before being packed up! On the evening of January 31, 2014, I was about to take a bath when some of the students came running to my house to tell me that Patience fell in to the fire. I stopped whatever I was doing and rushed to Patience’s house, before getting to the house I met with some member of that community they told me that Patience was try to make food for the house that was how she fell into the fire. Within that time another person has taken her to my house, I rush back home and met this child with her face all burnt up. The family of this child knows that she had been ill with epilepsy for years, and this time she had stopped taking the medication for no reason. She had been doing the cooking for her family when she had an episode and fell into the fire. I went to find a car to take her to the hospital. It was very difficult to find car at that hour. I managed to get a car that we used for that night and we paid the driver fifteen united states dollars to drive us to the JFK hospital. Patience has now made one month in the JFK hospital, and she responding to treatment on a day-to-day basis. She can talk and eat, and is getting better every day. I met Patience many years ago, she was selling bananas on the street. She’s now one of our older students. She’s very helpful and loving. 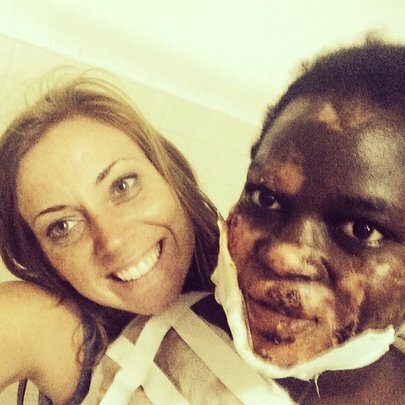 She has epilepsy and during an episode fell into a fire stove. The photo below is her after one month of treatment; she looks so much better! We are beyond thankful that we have healthcare for the girls. Otherwise, she likely would have died. I wanted to tell you this story because YOUR DONATIONS MATTER. You are making a difference in Patience’s life. Because of you, we are able to pay for Patience’s treatment. Every day, we continue to fight for the girls of West Point. This Saturday, March 8th, is International Women’s Day. The Ministry of Gender chose to honor More Than Me – their focus is Mentoring for Transformation. We see our girls transforming into leaders every day. The girls are excited to take part in a day that celebrates women in Liberia. A day that celebrates perserverance and strength for girls like Patience. Change is happening. We can feel it. Will you make a lasting impact for more girls like Patience?